Hitting REPLAY on one of my favorite Posts. and I can't wait to be able to be out on my patio again! You can see the full transformation here!.. I have a fun little makeover for you this Monday! the patio stuck out like a sore thumb. so I just had to buck up and do it! This was the before...now you know WHY it stuck out like a sore thumb against the freshly painted house. 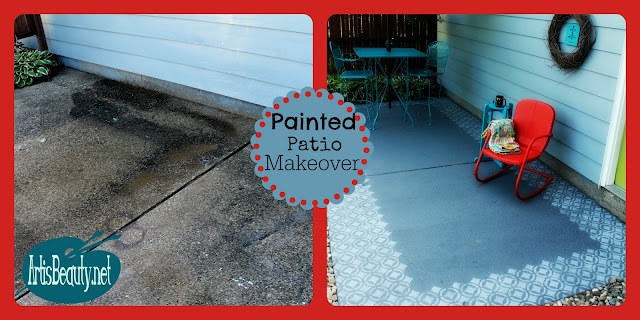 The patio has seen YEARS and years of wear and tear. It had tons of pitted spots and lots of stains and mildew. the first thing I had to do was Power wash and scrub the whole thing . You can see the difference already with just the cleaning. but it still was rough looking. I started rolling it on and was thrilled with how great it looked already. I can't just have a plain patio. 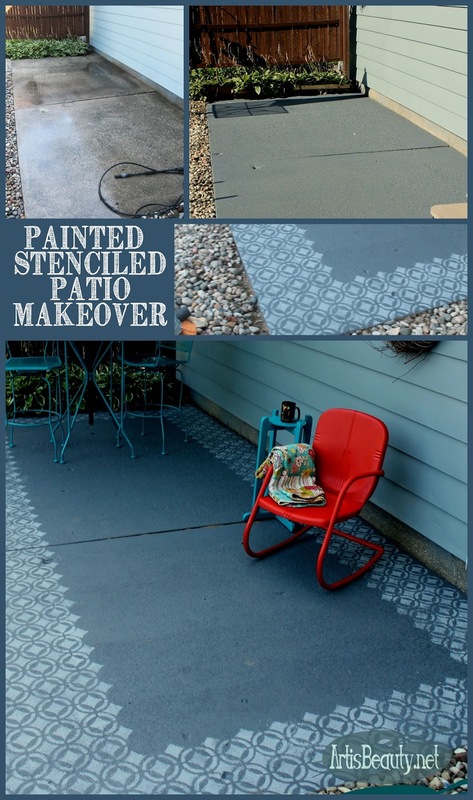 So I grabbed one of my Mylar floor stencils and a lighter gray patio paint and started rolling on my stencil. I was in LOVE...I wanted it to look like an outdoor rug so I just ran a border around the outside edge of the patio. I was so happy with the results. It is now one of my favorite places to have coffee in the morning. Its not fully decorated yet. As usual its a work in progress, but I just couldn't wait to show you. I hope you enjoyed this quick makeover. link party to show us what you have been working on. Go make someone's day beautiful!